American author and academic Alastair Lamb wrote of the Kashmir dispute as “incomplete partition”. He wrote that had it not been for the Kashmir dispute, Pakistan and India might have worked out their differences and existed as two prosperous nations “evolving towards each other” –which was the stated objective of partition in the first place- instead of away from each other. The cleavage instead has widened and Kashmir remains etched in the consciousness of Indians and Pakistanis – both anxious to claim it to complete themselves. So Basharat Peer’s memoir epitomizes the effect of this incompleteness that both Indians and Pakistanis have brought to bear on the lives of hapless Kashmiris. ISLAMABAD — A year after Benazir Bhutto was assassinated, Pakistan is still struggling to embed democracy and battle Islamic extremism, the causes for which she died. The same dark forces that appear to have killed Ms. Bhutto on this day last year – Islamic extremist groups based in Pakistan – seem to be behind the carnage in Mumbai last month, an event that pushed Pakistan into an even deeper crisis. Tensions between Pakistan and India, which blames “elements from Pakistan” for the Mumbai attack, escalated sharply yesterday after Pakistani military officials said that troops had been “pulled back” from the Western border with Afghanistan. Unconfirmed reports said that thousands of troops had been redeployed to the border with India in what would be the first concrete sign that either side was preparing for conflict. For Ms. Bhutto’s admirers, and for many other Pakistanis, the issue that rankles most on the first anniversary of her murder is the apparent lack of any investigation into who killed her, despite the fact that her own Pakistan Peoples Party was elected into government 10 months ago. This omission says much about the state of the country. It was only yesterday that we were mourning for the loss of an icon of our times. The much loved, and passionately hated Benazir Bhutto whose tragic murder in broad daylight was the greatest metaphor of what Pakistan has turned into: a jungle of history, ethnicity and extremism. 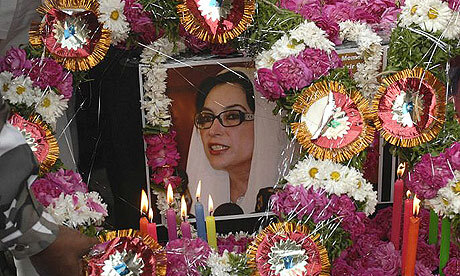 Little wonder that Bhutto’s worst enemies cried and lamented the loss of a federal politician whose life and times were as unique as her name. The populist slogan – charon soobon ki zanjeer (the chain of the four provinces, literally) could not have been truer than the most tested of axioms. As if her death were not enough, the state response was even more brutal. Why did she participate in public rallies? On that fateful day of December 27, 2007, why did she invite death by sticking her neck out – literally and metaphorically? This was tragedy compounded by invective and betrayal. After all, had she not received a tacit understanding from the then military President, General Pervez Musharraf? ye jo karbala, is baar barpa ki gai..
us karbala per bayn karney waly..
kisi kandhey key mutlashii rahey..
aur koi qalam TooTtney per..
Born in Srinagar, Khalid Hasan is a senior Pakistani journalist and writer. His journalistic legacy and proficiency as a writer began with The Pakistan Times as senior reporter and columnist in 1967. Upon Zulfikar Ali Bhutto’s request, he had the prestigious honour of becoming his first press secretary. He held the additional honour of postings in Paris, Ottawa and London for five years in the country’s Foreign Service. The British first interaction with the Frontier came when Monstuart Elphinstone visited the area in 1809 and his ‘ An Account of Kingdom of Kabul’ was first British account of this area, which was gaining importance due to ‘Alarmist Policy’ followed by Britain due to Czarist expansion in Central Asia.